C.H. Pontzer and H.M. Johnson, Measurement of Interferons. T.L. Whiteside and R.B. Herberman, Measurements of Natural Killer Cell Numbers and Function in Humans. R. Scicchitano, A. Wozniak,J. McNeil, S.J. Usher, and W.H. Betts, Functional Assays to Determine Effects of Mammalian Tachykinins on Human Neutrophils. E.P. Cowan and S.S. Dhib-Jalbut, Molecular Techniques for Detection of Gene Expression in Neuroimmunology. W.E. Winter, R.H. Buck, and D.A. Varga-House, Class I and Class II Major Histocompatibility Complex Molecules. A. Miadonna, M. Palella, M.P. DiMarco, and A. Tedeschi, In Vitro Immunoglobulin E-Mediated and -Independent Histamine Release from Human BasophilLeukocytes. M.E. Sales and E.S. Borda, Immunopharmacological Methods to Study Murine Allogeneic and Syngeneic Pregnancy. L.H. Elliott, S.L. Carlson, L.A. Morford, and J.P. McGillis, Preparation, Characterization, and Use of Human and Rodent Lymphocytes, Monocytes, and Neutrophils. R.J. Vandebriel, J. Garssen, and H. Van Loveren, Methods in Immunotoxicology. D.A. Halliday, J.D. McNeil, W.H. Betts, and R. Scicchitano, Effects of Tachykinins on Chondrocyte and Synoviocyte Function. B.S. Rabin, M.A. Pezzone, A. Kusnecov, and G.E. Hoffman, Identification of Stressor-Activated Areas in the Central Nervous System. G.A. Belokrylov and E.I. Sorochinskaya, Methodological Approaches for Studying Neuroimmune Connection of Identical Functional Blocks. G.B. Stefano, Computer-Assisted Microscopic Image Analysis in Neuroimmunology. V.W. Yong and V. Balasingam, Cytokines as Mediators of Reactive Astrogliosis. H. Imboden and D. Felix, Immunocytochemistry in Brain Tissue. J. Dalmau and M.R. Rosenfeld, Characterization of Neuronal Antigens and Antineuronal Antibodies. W.J. Streit, A.G. Rabchevsky, D.P. Theele, and W.F. Hickey, Immunohistochemistry of Leukocyte Antigens in Rat Brain. M.I. Phillips and L.D. Fannon, Measuring Immune Responses to Brain Manipulation in Rat. B.S. 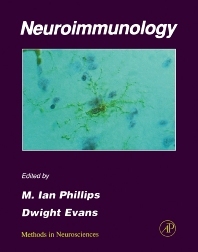 Zwilling, Methods in Neuroimmunomodulation of Macrophage Function. D.T. Lysle, Stressor-Induced Immune Alterations in Rodents. B.R. Darby and L.D. Fannon, Measurement of the Immune System in Response to Psychological Intervention. C.C. Maier and J.E. Blalock, Cloning and Sequencing Immunoglobulin and T-Cell Receptor Variable Regions Involved in Neuroimmune Disorders. S.L. Carson and J.P. McGillis, Modulation of Leukocyte Adhesion, Migration, and Homing by Neurotransmitters and Neuropeptides. J.P. McGillis, Neuropeptides as Immunomodulators: Measurements of Calcitonin Gene-Related Peptide Receptors in the Immune System. I.R. Tebbett and J. Karlix, Effects of Cocaine on the Immune Response. R.M. Donahoe, J.J. Madden, D.R. Oleson, and C.B. Nemeroff, Immunological, Pharmacological,and Electrophysiological Detection of T-Cell Modulation Properties of Substances of Abuse. Index. The volumes in this series include contemporary techniques significant to a particular branch of neuroscience. They are an invaluable aid to the student as well as the experienced researcher not only in developing protocols in neuroscience but in disciplines where research is becoming closely related to neuroscience. Each volume of Methods in Neurosciences contains an index, and each chapter includes references. Dr. Conn became Editor-in-Chief of the series beginning with Volume 15, so each subsequent volume could be guest-edited by an expert in that specific field. This further strengthens the depth of coverage in Methods in Neurosciences for students and researchers alike. Neuroimmunologists, immunologists, neuropharmacologists, neurophysiologists, neurochemists, biochemists, molecular biologists, and physiologists. J. Hillis Miller Health Science Center, University of Florida, Gainesville, U.S.A.